Enjoy the Wairarapa Times-Age Digital Edition on your tablet, smartphone or laptop! The Wairarapa Times-Age is your source of local news, views and sport in Wairarapa. Locally owned and independent, we know what makes our region tick. The Times-Age digital edition is an online version of our printed newspaper, with all the stories, photos and features that our readers love. An easy-to-use interface lets you explore our pages just like a physical newspaper, as well as allowing searches and sharing of articles. It will even read to you. 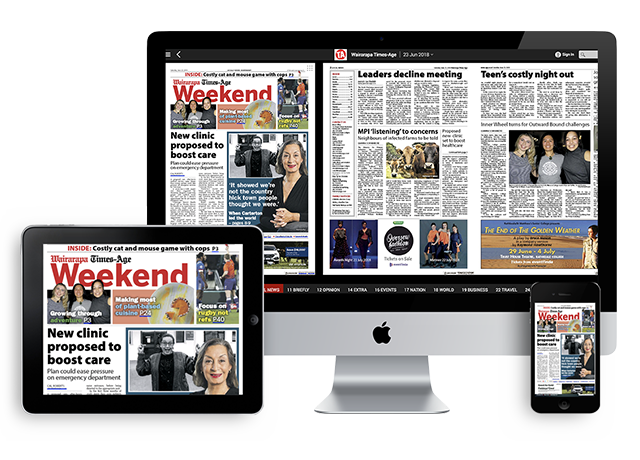 Get the Wairarapa Times-Age digital edition delivered right to your PC, laptop, tablet or smartphone, Monday to Saturday. You can upgrade or cancel anytime. Some subscriptions will be automatically renewed. Your credit card will be billed for the agreed amount at the beginning of your subscription and at each point when your current subscription expires. You can cancel payment at any point by sending an email to our Customer Support team at least two business days prior to the expiry date of your subscription. If you cancel payment, you will not be able to access your subscription after the end of the current subscription period. Read stories in your news feed on one device and pick up where you left off on another. Subscribe and authorise up to three devices with one account. Your favourite newspaper packaged just the way you want it! The Wairarapa Times-Age Digital Edition is full of interactive features to engage and delight news lovers. Familiarise yourself with each one of them and enjoy the benefits of an enhanced news consuming experience. Please Note: Not all features are available on all devices. Download your digital edition on mobile device and read it anywhere. On-demand narration is a great feature for users who like to listen to their magazine while multitasking or who are visually impaired. Post your comments on articles you have an opinion on and read those of others. Love an article? Share it! You can get a direct link to an article, post it on Facebook and Twitter, email it or copy it onto a note-taking app. Receive an email alert as soon as the current issue of your favourite publication is available. Print articles and crosswords anytime you need. Save articles for future reference. Using our tool you’re able to create as many Collections of stories as you like. Download your E-dition on your mobile device and read it anywhere. Our new tool offers instant translation in up multiple languages for most articles and even full publications. Wairarapa Times-Age is locally owned and independent, continuing a long and proud history of news journalism in Wairarapa. Today the Times-Age employs more than 35 people in Wairarapa. © Wairarapa Times-Age, Inc. All rights reserved.